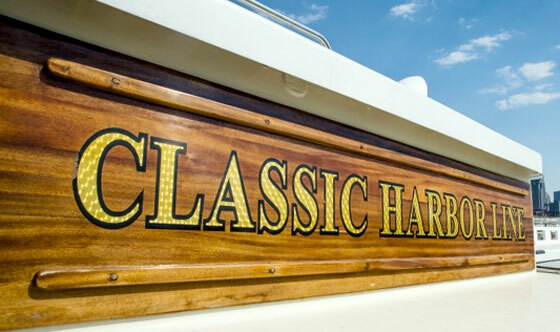 Classic Harbor Line is the operating company of schooner Adirondack III and luxury yacht Northern Lights of Rowes Wharf. Operating sightseeing boat trips in Boston Harbor waters since 2013, Classic Harbor Line specializes in bringing beautiful, classic-style yachts to Boston’s waterways and creating special and memorable excursions. 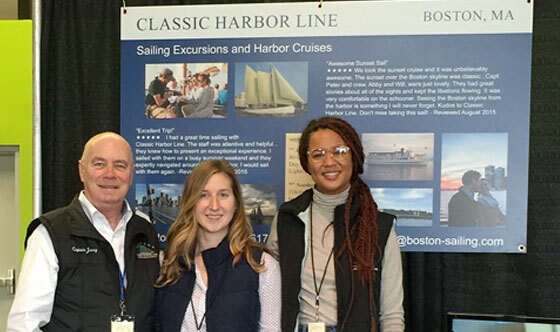 Our Crew, including all captains, mates, and on-land representatives at Classic Harbor Line Boston, are what make the experience on our beautiful yachts truly magical. We have maintained a consistent history of not only operating with a professional staff, but also with warm and inviting hosts. You will, without a doubt, have fantastic views of the city on your Boston sightseeing boat trips and find the boats beautiful and comfortable. What will surprise you and stay with you when you leave is the warm and special treatment you receive from our extraordinary team. All of our captains are Coast Guard certified. 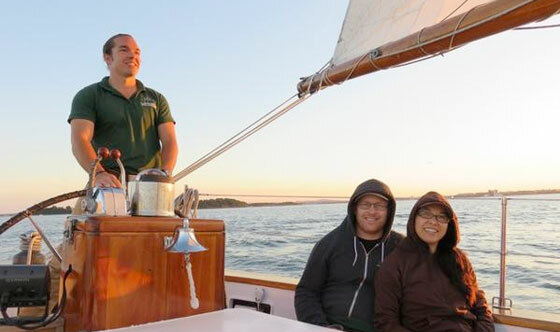 The schooner captains all have a minimum 50-ton license and a sailing endorsement. Northern Lights captains all have a minimum 100-ton license. Our captains are also trained in first aid and CPR and are registered in an ongoing drug-testing program. Perhaps of equal importance, we require that our captains have an appreciation for quality service and are extremely charming hosts. Mates on both the motor yacht and the sailing ship undergo extensive safety and marine training. 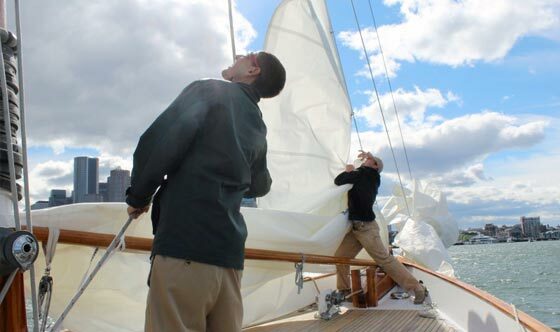 Many of the schooner mates also have extensive sailing, racing and/or teaching experience on smaller sail vessels. There are a number of behind-the-scenes crew members at Classic Harbor Line. They are the team who answer the phones, plan your event, greet you on the pier and is happy to tell everyone about the cool cruises and sails that we have to offer. Everyone who buys a ticket for a trip gets to meet a Land Ambassador at check-in. They are full of information and they are the most hospitable people you will ever meet! Ask them for recommendations on dinner after or before a sail or a suggestion on a future excursion. If you are interested in employment with Classic Harbor Line, we want to hear from you! We are always looking for experienced captains and mates with a strong background in hospitality and/or marine maintenance. Please feel free to forward a letter and resume to [email protected]. As the Freedom Trail enters its second half century, it can proudly celebrate the fact that it has become the one of the most signature tourist experiences in New England, attracting over 3.2 million people annually. We’re an entirely new kind of museum, where you’ll not only view artifacts of historical importance, you’ll also have an all- encompassing, multi-sensory experience. At the Boston Tea Party Ships and Museum, our museum experience will transport you on an incredible journey back in time as you take part in the famous event that forever changed the course of American History! Ride City View Trolleys through the streets of Boston and discover why it is called the Cradle of Liberty! Learn about events like the Boston Tea Party, Paul Revere’s Ride, The Boston Massacre, and the role Bostonians played in the American Revolution. See Boston though the lens of your favorite TV shows and movies on the Boston TV & Movie Sites Bus Tour and Boston Movie Mile Walking Tour. Tours are led by local actors with on-set experience. Visit locations seen in Cheers, The Departed, Good Will Hunting, Mystic River, The Town, Ted, Legally Blonde, and many more!